We wrote this synopsis primarily to give an outline of our solution ( 39), but also to highlight some of the problem's main features and interdependencies, in an attempt to clarify the structure. Although the style may be unfamiliar, we hope that it will be helpful, for reference purposes. You will find a further overview that highlights technical details in more depth in the chapters "Technical Notes". We have also written a more historical outline ( 775). In Dia 0, at the very beginning, / / / / / / are all weak. The other groups can live. can get two eyes, but then must let / live at lower right, and will probably die. If all major groups live, is most likely to win with more territory. primarily threatens the life of / , and only secondarily threatens to connect , and . tries to connect , and . If succeeds, then dies. If dies, and does not kill a big group, then loses. If we look ahead to Dia 6 ( 24): there will be a liberty race between / , with / / / / / , and , temporarily caught in between! is stable, and not involved in the fighting below. 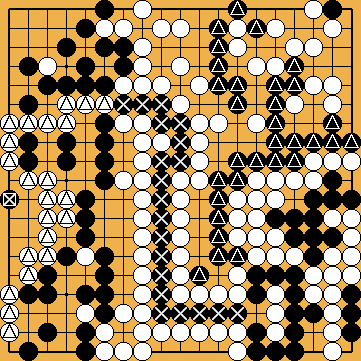 Neither player succeeds, and gets cut off, as do / (forming a simple seki). now plays some kikashi, spoiling 's shape, which will make life easier for him in a far future. still does not try to build two eyes for , with at 18, instead. The territorial balance is still in 's favour overall. (which we call the "second throw-in"; 914) is a surprising sacrifice that was assumed for decades to be harmful for the solution or at least would lose points unnecessarily. Neither , , nor , can live independently; cannot link out to the left. 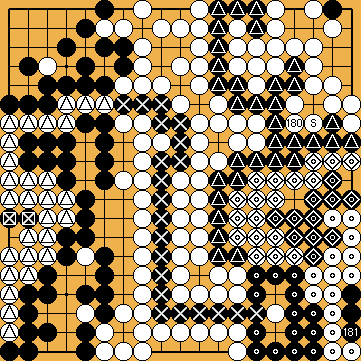 By Dia 3, / / / form what is almost a hanezeki (a strange seki, where both players can capture, but normally neither wants to; 1111)! Only the tail is still missing - it starts with . The dotted path through 's potential territory in the centre will become a one-way street. Both , and , will be either captured together (the regular case), or they will live together (the exceptional case). Due to their closely tied co-existence, we will further neither mark, nor mention, them. The groups in the hanezeki will remain untouched for a long period of time; we will not mark them temporarily from here on, until they get into focus again. The hanezeki's tail, , wanted to escape, but could not, and kept growing bigger. wanted to stop the growth of the hanezeki's tail, , which destroys her potential territory in the centre, but could not. Else would lose her stones in the lower right corner, and so the game. On the other hand, the larger becomes, the better for , should she ever get the chance to capture . At the end of Dia 4, , and cannot connect. 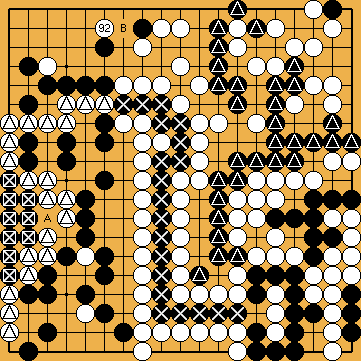 Before carrying on with the main business, takes the chance to play some forcing moves ( / / ; 790), at no cost to himself, but reducing 's potential territory in the top right corner, for the time being. Now, after her large territorial loss in the centre, cannot allow to simply get two eyes in the upper right corner any longer. In the meantime, the territorial balance has shifted in 's favour. Michael Redmond 9p kindly drew our attention to the kikashi in the bamboo joint ( 838), which "naturally" gains an additional liberty for . However, has to recognize that only one additional liberty does not really help with the semeai, so he waived this move. has three main options now. ... aiming at forcing to capture , so saving . However, by following option (Ia) - the classical line of play again - will be taken by surprise over 60 moves later, and lose the game by a small margin. Black also cannot hope on a semeai against 's group on top - option (Ib) leads to a very complicated ko-fight that ends with a win. (II) After a long search, found the very calm, and contained, move of (the guzumi; 893), which further destroys 's potential territory in the corner and re-opens the path to success. After , has to make a big decision. has the option to play tenuki at top right, and let live, while hoping that she can get sufficient compensation by attacking / , and parts of , on the left side. However, after much analysis ( 432), sees that this option does not provide a better result for her than , and so she has to play , which stops from getting two eyes. It is , and the previously played forcing moves / ( 790), which are the main reason that our solution looks different to the Solution of Fujisawa Hideyuki 9p ( 754). Please refer to the end of this tour ( 30) to see, why Fujisawa's Solution does not work any more. After the short, but decisive, intermezzo in the upper right corner, returns to the classical line again, with playing the Crosscut Sequence in the top left centre. ... cannot set her hopes on capturing , with . 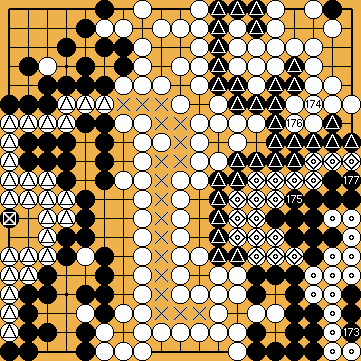 As usual with a hanezeki, she will lose / , and so the game. ... cannot set her hopes on a semeai between her -group on the bottom and in the upper right, without capturing . She will be one step too late to win the game. ... cannot hope on attacking on the upper edge, which is stable now. As usual with a hanezeki, must not connect the tail, , with a move at , so remains as his only target for attack. 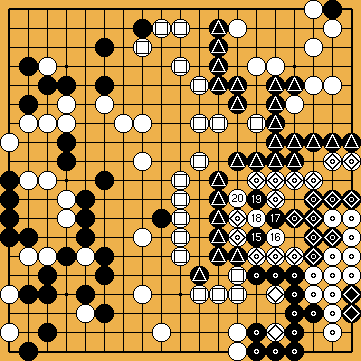 , by attacking , will try to make capture , then he can (probably) save - this becomes clearer after Dia 10 ( 26). If refrains from capturing , can reduce 's liberties so that he can safely connect at . However, saving does not mean saving . N.B. / / are all stable, and alive. , to win the semeai against , tries to live with outright, starting with , but will not manage to get two eyes for eventually, despite she will be able to capture . We know already that, before capturing , must wait until it is profitable, if ever. So must hope on receiving sufficient compensation due to 's need to keep her -group down to only one eye. And indeed, will add to, and then repeatedly sacrifice, , later. Now, attacks , and gets bigger. If is to avoid capturing , she must not lose the liberty race between , and . But is not in a hurry, and can take a rest now, just before capturing with a move at . looks around on the board, and realizes that the outcome of the main semeai, between and , is already decided. Neither can capture , while saving , nor can capture , while saving . and will die together, or they will live together. 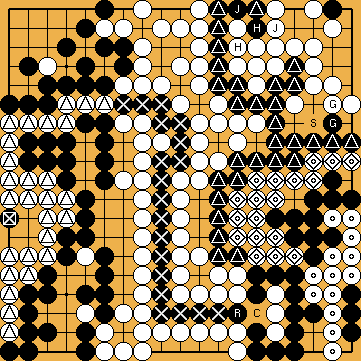 So takes sente with the tsuke of ( 787) to start the endgame on the left side - she fixes the boundaries, first at top, and then at the bottom. Thereafter, will return to the main semeai by capturing with . Then torpedoes 's hopes on two eyes for with the oki at . will continue to take 's liberties, while takes 's liberties. Meanwhile, repeatedly sacrifices , and gets more prisoners. When (= ) is played, again is at a fundamental decision point. -	 can still capture (by starting at , for example), but then will kill ( 510). -	Instead, can play at , capturing , and saving . However, this will let live, while capturing , and ( 583). Throughout all of Dia 6 - Dia 10, is handicapped by the imminent threat of what we call the Punishment Semeai. At the moment that plays into 's eye on the left, has eight liberties. If has lost only 1 more liberty in the process so far, will capture at now. After recaptures at , will start taking liberties of immediately (at , for example), and win the capturing race between , and , by one move. 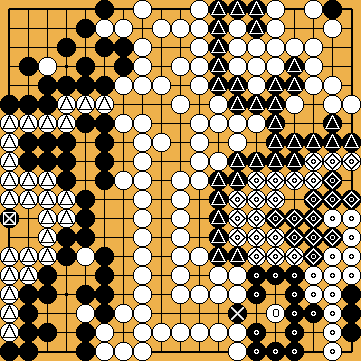 Ever since the forcing moves in the top right corner ( / / ), it is better for to kill , and sacrifice . Therefore, continues to occupy 's liberties (with at ), and connects, and saves, (with at ), eventually also killing . 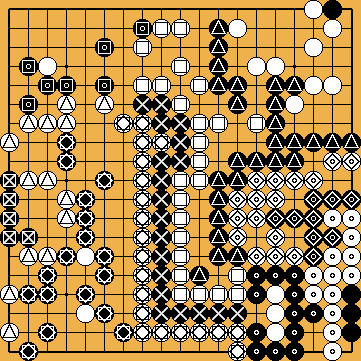 N. B.: We use the term "Semeai Variation" throughout this book to name this kind of variation, in which White (instead of capturing Black's centre) takes further liberties of Black's top right group, eventually capturing it. 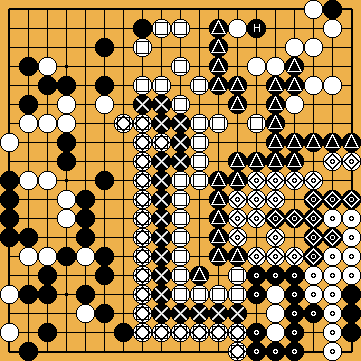 Both players then take each other's liberties, until we reach the position shown in Dia 11. Finally, kills , and kills , so saving . Both of the larger groups that were in the liberty race - , and - have died! Note that the seki (with / ) slowed down the semeai on the right side. wins the fight with , but cannot save . lives. We now have Dia 12. N.B. is dead. 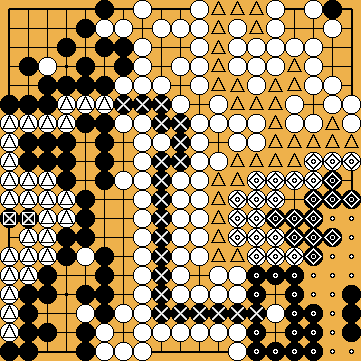 We can now see that the additional seki of / (compared to the classic version of a hanezeki, in which there is only one group, and no one in-between), serves also to adjust the score, i.e. making this Semeai Variation relatively close. We have reached the end of our solution. However, we will now take a quick look at some other key features, and interdependencies. After (= ) is played into 's eye on the left side in Dia 10, can, instead, capture with - this is similar to the variation of the Fujisawa Solution ( 754). Next, recaptures at . 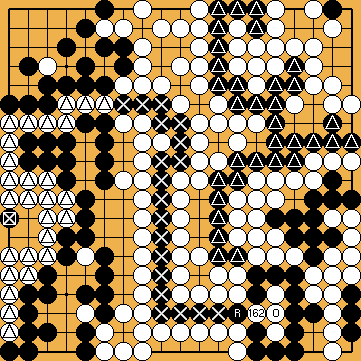 can't kill , so takes points in sente, with the oki at O ( 884). N. B.: We use the term "Capture Variation" throughout this book to name this kind of variation, in which White captures Black's centre. Please also note that Fujisawa Hideyuki 9p played the endgame on the left side last, after capturing the centre, in his solution. Both players now take each other's liberties, with first capturing , and finally playing to capture . The picture in Dia 14 looks completely different from Dia 12. In our solution (Dias 1 - 12), will do better by two points ( 512), when not choosing this variation. 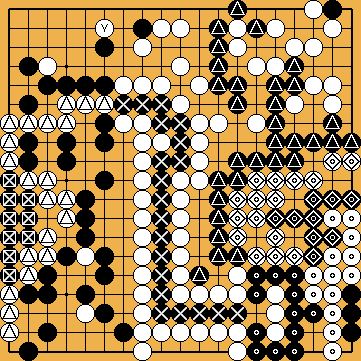 ... and the tsuke of in Dia 8 ( 25) / Dia 16 (worth two points). The combined gain is six points. The variation of the Fujisawa Solution included neither of these moves (nor the second throw-in at 19 in Dia 2 ( 20) with a gain of one point for in our Capture Variation, see below), so it was thought that would win by three points. 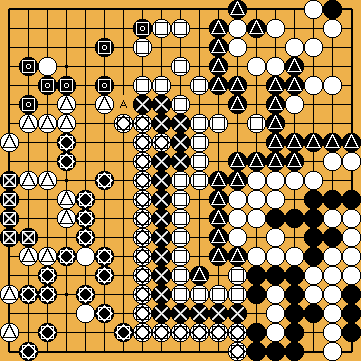 The discovery of these two moves for , then gave a win by three points, apparently destroying the known solutions. ...and the (second) throw-in (worth one point in the Capture Variation here) - is eight points worse off. Without these (but with the profitable oki - see above), by capturing , would win by three points, as mentioned above. The importance of these new moves, in reducing 's score, is clear. Copyright © 2015 Thomas Redecker. Design by Jan van Rongen, modified by Thomas Redecker.